With the death of Antonin Scalia this past week, the U.S. Supreme Court lost its longest currently serving justice. Just a few weeks shy of his 80th birthday, Scalia served for 29 years and 4 months. 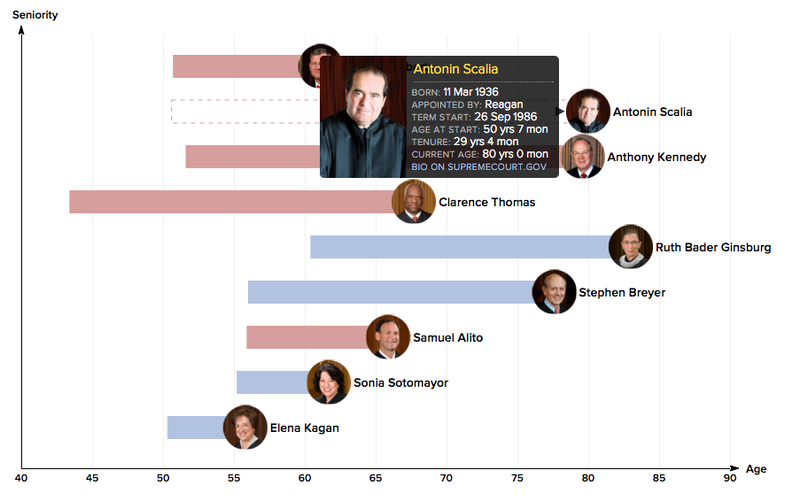 I looked that up using the interactive infographic I created last year, showing the age and tenure of each of the current justices. As the country debates when and how a new justice will be appointed to replace Scalia, I wanted to be able to answer a few additional questions. Which justice, historically, has served the longest? Who was the youngest (or oldest) at the time they took the bench? Who was the oldest active justice? 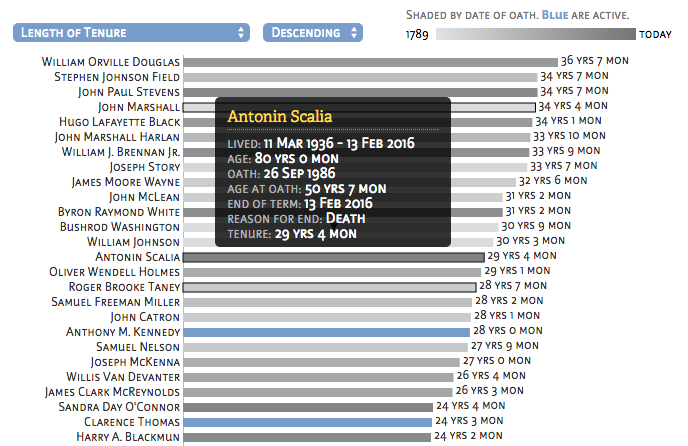 So, I compiled data on all the justices who have served since the formation of the Court in 1789 and built a new interactive graphic. You can sort the justices by length of tenure, age (current or at the end of their service), or by age at the time they took the oath of office. Turns out that Scalia had the 14th longest tenure in the history of the Court. Anthony Kennedy isn't far behind - he'll move from 19th to 17th in a couple of months, and will pass Scalia by the middle of next year. Who served the longest? The somewhat controversial William Orville Douglas, retiring after 36 years and 7 months on the Court.